What better way to follow up a fairy tale wedding than with a romantic getaway to "The Most Magical Place on Earth" for your honeymoon? Disney World has much more to offer than just cute animal characters and princesses. Honeymooning couples flock here each year to experience world-class cuisine, special events, exotic tours and carefree, magical fun that creates memories you'll cherish for a lifetime. Naturally, your honeymoon travel dates must coincide with the time of year you plan to marry. However, if your nuptials are still in the planning stages, you may want also to consider the best time of year to experience your honeymoon destination. Don't worry too much if you've already booked a June wedding. As long as you plan ahead for fine dining meals, luxury accommodations and follow a few tips and strategies for seeing or experiencing the top attractions, you can have a fantastic honeymoon at Disney World any time of year. Instead of typical housewarming wedding gifts, give your friends and family the option to contribute to your dream honeymoon. There is no charge to sign up for a honeymoon registry with Disney World and the process is very easy to follow. Create your registry account online and choose activities you'd like to do, room upgrades, attractions you want to see or ride, and restaurants you'd like to try. Send announcement cards or use the e-mail and social media tools provided by the registry to let your friends and family know where you are registered. Guests visit your online account and purchase the gifts you have selected. You will then receive a personalized gift card filled out from each guest. You receive the gift funds in the form of a check or secure bank transfer. The registry also provides an online "Thank You" tracker so you don't forget anyone when sending out gratuity notes. Gifts can be collected up to three times during the life of the registry. For more information, visit the honeymoon wishes contact page. The following hotels have romantic ambience, something to offer for grown-ups and are close to many of the park's top attractions. Recognized as the most romantic Disney property by Fodor's Travel, the Grand Floridian is a stunning hotel with an upscale, Victorian-era ambience. The hotel is also one of Brides Magazine's honeymoon hot spots. A stained-glass ceiling tops the ornate lobby where an orchestra serenades with live music. Ride the classic cage elevator to an upper-level room overlooking the lagoon. Treat yourself to a couples massage and citrus facial at Senses Spa. Be sure to book an early reservation at Victoria and Albert's, voted the #1 most romantic restaurant in Disney World by Disney Food Blog readers and the only restaurant in Orlando with a five diamond rating by AAA. Indulge in a six course meal presented by two servers with fresh ingredients flown in from worldwide locations. Epcot-area resorts come highly recommended for honeymooning couples by travel publications such as Destination 42 and park experts at Disney Tourist Blog. The Beach Club and the Yacht Club are adjacent to each other and equally priced. An expansive 3 acre pool area called Stormalong Bay joins the two properties which are each within walking distance of Epcot Center and a boat ride away from Disney's Hollywood Studios. At the Yacht Club, relax with a massage before devouring a steak and seafood dinner at the Yachtman's Steakhouse. Book a studio at the Beach Club Villas where you'll have a kitchenette perfect for keeping and reheating the tasty leftovers from fine dining restaurants. Romance and adventure go hand-in-hand at Disney's Animal Kingdom Lodge, recommended by both Brides Magazine and TripAdvisor. Wake up to giraffes browsing for a breakfast of leaves just outside your balcony. This rustic lodge decorated with one of the largest collections of African art in the U.S. and is surrounded by a 110 acre nature preserve with over 30 species of African wildlife. 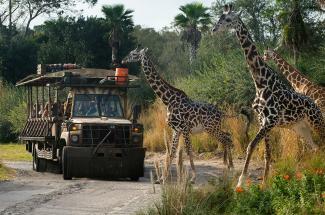 Concierge guests get extra perks like the Sunrise Safari, which takes place early before the Animal Kingdom Park opens for the day. Take a dip in the resort's 11,000 square-foot swimming pool complete with waterslide and gently sloping entry points similar to a natural watering hole. Experience award-winning African-inspired cuisine at Jiko, The Cooking Place, one of the top three choices of Disney Food Blog readers for romantic dining. Travel editor Lindsay Olander, who has trekked all over the world, chose Disney's Port Orleans Riverside Resort for her honeymoon accommodations. Newlyweds can enjoy romantic nighttime walks among colonial plantation mansions and arched bridges crossing over the winding river. Oyster.com recommends the Port Orleans Riverside Resort as a good choice for grown-ups, noting the romance of taking a horse drawn carriage ride through beautiful, meandering tree-lined paths in the bayou-like setting. Sample some of the authentic flavors of New Orleans-style cuisine at Boatwright's Dining Hall. Menu favorites include gumbo, jambalaya, voodoo chicken, sweet tea-brined pork chops and andouille-crusted catfish. Don't wait until you actually arrive at your Disney World hotel to make reservations at fine dining restaurants such as Victoria and Albert's and Jiko - you're almost guaranteed not to get a table. Most dining reservations can be booked up to 180 days in advance by calling 407-WDW-DINE. No matter what park you've hopped to in Disney World, there is no shortage of mouthwatering cuisine nearby. Because the food is so rich, you may not want to indulge in fine dining every single night. Plan for about three fine dining dinners on a seven day honeymoon and about four on a 10 day honeymoon. Be sure to add your top picks for fine dining restaurants to your gift registry. When visiting Epcot, take in some great seafood at the Coral Reef Restaurant. What makes this dining experience so unique is that the restaurant is surrounded by the largest inland saltwater environment ever built. Called "The Seas with Nemo and Friends," this live coral reef environment contains sea turtles, rays, sharks and 85 species of tropical fish swimming around in view of diners who can watch them through multiple panoramic windows. The second place choice of Disney Food Blog readers for most romantic Disney World restaurant is the California Grill. Located on the 15th floor of Disney's Contemporary Resort, an early seating will delight newlyweds with a beautiful Floridian sunset while enjoying Pacific Coast cuisine. Late diners get one of the best views of the Walt Disney World Resort fireworks show, when the restaurant dims the lights and pipes in music to enhance the magical display. Located at the foot of the Beast's Castle in Fantasyland, you'll find one of the most expansive and elegant restaurants in the park. Be Our Guest Restaurant offers French-inspired specialties in one of three elaborately decorated dining rooms themed from the classic Disney love story, Beauty and the Beast. The menu is the same throughout the restaurant, no matter which elegant room you are served in. Disney World has something for everyone, at every age and practically any interest. Do grown-up things one day and relive your childhood the next. Veteran honeymooners of Disney World like to stress the importance of slowing down and truly enjoying each experience. If you've kicked up your heels late into the night, plan on something easy and relaxing the next day, such as lying out by the pool at your hotel and getting a couple's massage in the afternoon. Epcot's World Showcase Bar Crawl: Also known as Drinking Around the World, a honeymoon must-do (unless you don't drink) according to Brides magazine, the bar crawl will lead you and your hubby to enjoy sipping margaritas in Mexico, sampling beer or wine in Germany and drinking from the sake bar at the Japan Pavilion. With a total of 11 countries, you might need a nap after this one or combine it with Snacking Around the World. 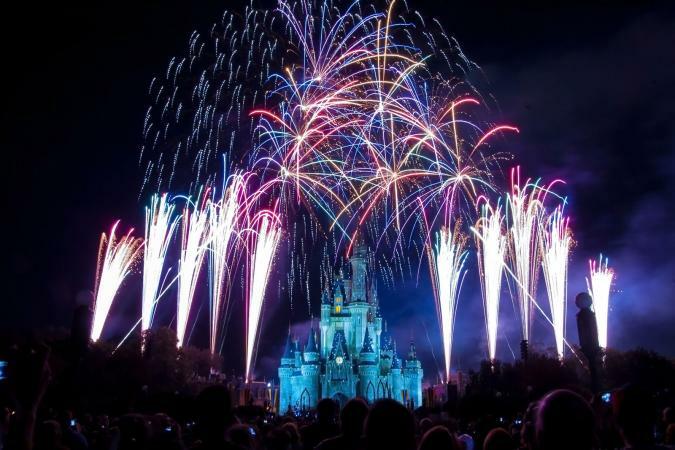 Specialty Cruises: Take an enchanting evening cruise to enjoy the world-class fireworks show of the Magic Kingdom Park or Epcot. Take a celebration cruise with champagne and strawberries and toast to your future together or share a decadent dessert platter. Water Parks: Visit one of Disney's two water parks. 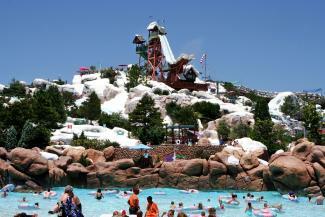 Ride the runoff rapids at Blizzard Beach or bounce around in the wave pool at Typhoon Lagoon. Space Mountain: For newlywed adrenaline junkies, what could be better than a thrilling roller coaster ride in the dark? Enjoy the Nightlife: Hot spots for fun in the evening might include a stroll along Disney's Boardwalk, followed by heading inside the Boardwalk Inn for some dancing at the Atlantic Dance Hall. Bar hop over to the nearby lounge called Jellyrolls. Downtown Disney keeps the good times rolling with places like Ragian Road, with great Irish food and plenty of entertainment. It stays open late too. Do Some Kiddie Rides: Take advantage of those Extra Magic Hours when the park is open to resort guests as late as 1, 2 or even 3:00 am to ride a flying Dumbo (which will seem so much faster as the lights blur by at night) or to take a giant tea cup for a spin. When the small tots are fast asleep in their beds, it's time for the adults to come out and play! Just go easy on the drinks that night. Go above and beyond what you might normally do on a regular vacation to ensure your honeymoon stands out as a trip of a lifetime. Make Your Fast Pass+ Reservations: Once you've booked your hotel reservations, create an account at My Disney Experience. Purchase the tickets for the rides and attractions you plan to use with FastPass+ and 60 days prior to the ticket date, apply for the reservation. Purchase a Memory Maker: Let Disney PhotoPass photographers capture the two of you in iconic locations, in the best lighting and in action shots you would never be able to capture on your own. Download all of your photos and videos, which are automatically linked to your Disney account and pick the best shots to make into prints. Get a Honeymoon Souvenir: In addition to your free buttons, purchase a custom or romantic themed souvenir to commemorate your honeymoon. Ideas include a hand painted Christmas ornament, bride and groom mouse ears (which you can personalize with your names later by doing it yourself), and bride and groom Disney figurines. Seasonal Events: If you and your loved one are a couple of real foodies, taste the finest global cuisine during the Epcot International Food and Wine Festival scheduled in the fall. Celebrate your new beginning in spring with the Epcot International Flower and Garden Festival. If you love Christmas lights, early December might be the target date for you. Check the events and tours page on Disney's website to see what's going on throughout the year. Special Tours: Based on your interests, a guided tour with animal encounters or a behind-the-scenes tour can create memorable experiences. 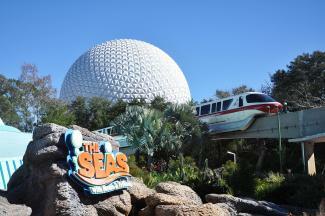 Epcot offers some great experiences with sea life with Dolphins in Depth, Dive Quest and Aqua Tour. Add a Caribbean Cruise: For the ultimate Disney-themed honeymoon, do a 7 Night Land and Sea Cruise. Spend the first few days exploring the Magic Kingdom Park and Epcot. End the week aboard the Disney Wonder cruise ship, sailing through the turquoise waters of the Caribbean Sea and snorkeling off the coast of Disney's private island, Castaway Cay. Plan Ahead, Relax and Have Fun! The work you put in to a carefully planned Walt Disney World honeymoon will really pay off in the form of a fun, hassle-free, relaxing escape for you and your sweetheart. Get help planning your trip by calling a Disney honeymoon adviser at 321-939-4610. You can also request a free honeymoon brochure and get a complete tour of the four theme parks, two water parks and over 20 resort hotels at Walt Disney World with a free vacation planning video.